The first bridal bouquet was created with deep red peonies, black magic roses, black baccara roses and lots of red feathers. The bouquet was bound with a black suede ribbon that I found in San Francisco. This bouquet has lots of drama to go along with the mystery. 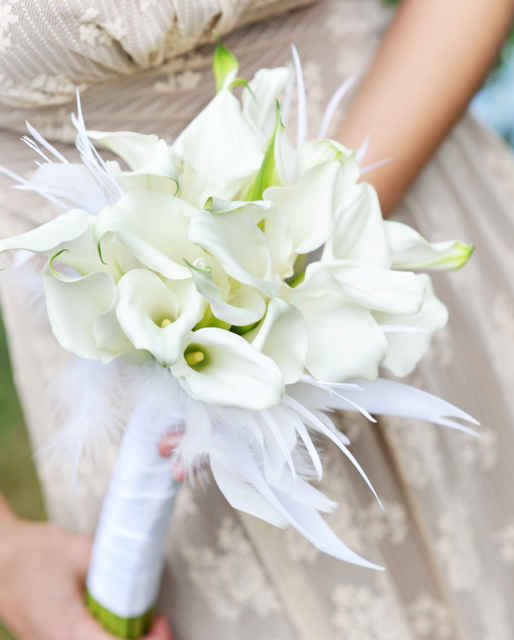 The second bouquet was created with at least 25 mini white callas. We collared the bouquet with white feathers and bound the bouquet in satin ribbon. Both of these bouquets were created for my HollyWood inspired wedding. Mystery photographer happened to stop by the day we were creating them just in time to make them famous. ALL of your bouquets for this shoot have been fantastic! I can’t wait to see who this photographer is, love new work and talent! I am dying to know who the mystery photographer is!! !